We are all familiar with this age-old cliche, but it's really true here. My mom's freshly baked granola is the best. Chewy, crunchy, toasty, with lots of honey - it is heavenly. It has been years since my mom made this granola, but I still crave it. 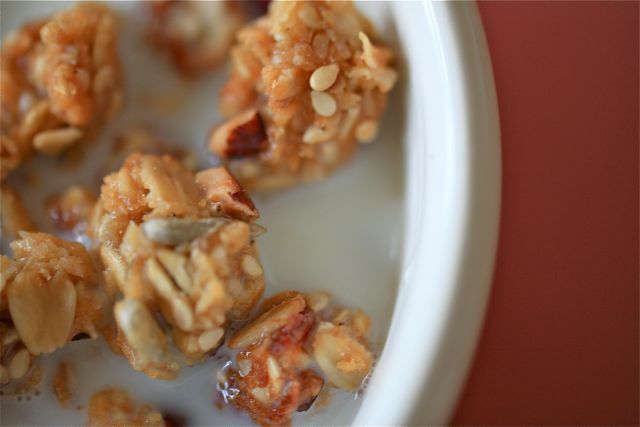 During a recent granola jones, I called mom to see if I could get my hands on her old recipe. Sadly, it was tossed out in her recent move. She tried to remember ingredients.... dry milk powder, sesame seeds.... bake at 275?... With these cryptic clues, I began a determined quest to recreate her granola. Cooking with a scientific approach is not my thing - I am more the improvisational, intuitive type in the kitchen. But on this quest, I adjusting measurements with the extreme precision of a lab technician. I read countless recipes. I baked many, many batches of not-quite-right granola taking copious detailed notes along the way. Finally, I got it. 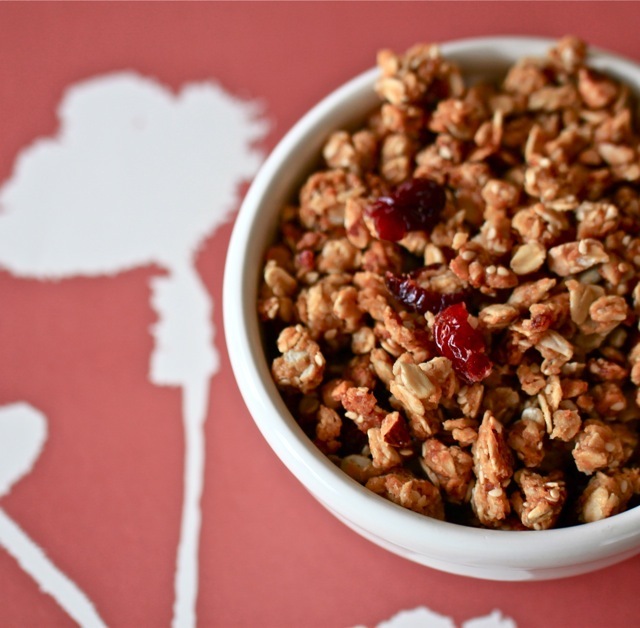 There are so many variations to be enjoyed with the basic granola foundation: skip the coconut oil and substitute with more butter and safflower oil; use pecans or walnuts in place of the almonds; try sultanas instead of dried cranberries; leave out the shredded coconut, or sunflower seeds, or whatever tidbit is not to your liking. Have fun and enjoy your own granola. I'd love to hear about any great variations you discover. Mix all ingredients until well integrated. Pour granola mixture onto a baking sheet. Don't spread it out too much, keep it clumped together near the center of the pan. (I put my oven rack close to the top of the oven so that the bottom doesn't brown too quickly.) Bake for 20 minutes. Then take out granola, mix and spread out more evenly over the entire baking pan. But don't break up the clumps too much, we want those chewy clusters later. Bake another 8-10 minutes, mix granola again to insure even browning. Bake 8 -10 more minutes and you should be ready. The granola should be only golden brown, not too dark. Try to wait until it is cooled before indulging in a bowl. As the granola cools its wonderful texture emerges, becoming chewy and delicious. 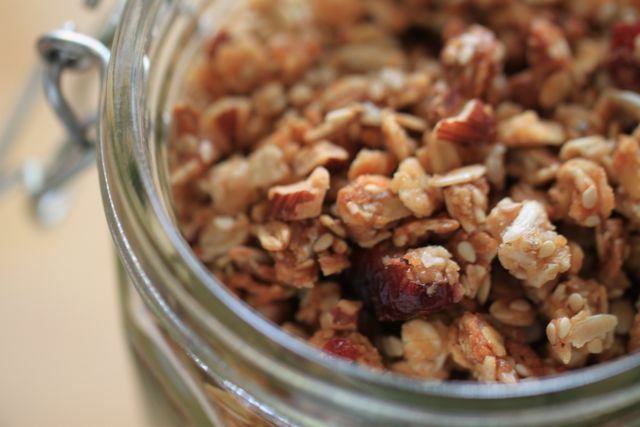 If you are willing to part with a little granola, pack up a jar or two and share with friends. Have you tried making your granola with applesauce inplace of the oils? It forms a crunchy oat cluster and nice flavor. here are a few blogs making granola with applesauce so that you can get ideas. There is nothing better than homemade granola... yours looks so good!!! Dry milk powder is new to me, great addition! Thanks for sharing this recipe! It looks like a gorgeous combination of ingredients, and I'm quite intrigued by the idea of a chewy granola... I'll definitely be giving this a go when we finish up our current batch of muesli. Great stuff! I made a batch the other afternoon, and it's clumpy and crunchy and oh so tasty. Thanks for the recipe! dashi and i looked up your recipe for granola at whole foods on my iphone. ah, technology. we bought ALL the ingredients. super exciting. can't wait to have more of your yummy granola. i've never had coconut oil in my house. very exciting. Phyllis, I love the image of you and Dash at Whole Foods with the iphone checking for ingredients. I am thrilled to be part of your first purchase of coconut oil. The stuff is delish! This recipe looks really great.. but I couldn't find the safflower oil - can I substitute something else for it??? I think canola could be a good substitute, but I think any light veggie oil should work. I found this recipe via another website and loved the look of it (i'm a very visual person). i have a batch in the oven and man does it smell heavenly!!! love this. I've been snacking on it nonstop since I made it 3 days ago, can't get enough. I added a couple handfuls of pecans, a teaspoon or 2 vanilla, 1/2 cup wheat germ and a couple tablespoons of brown sugar. fantastic chewy granola, thank you! Robin! Thanks for the great feedback. I love hearing that you had some fun with the recipe.... Pecans, vanilla, brown sugar... so good! Happy New Year to you. Oh man, this was the bomb. I found it searching "chewy granola", and it didn't disappoint. I subbed almonds for sunflower seeds, and agave for honey (what I had) and it was delish. I also threw in some flax seed, cause I gotta get rid of that stuff somewhere! Awesome recipe. Funny Miriam! Damn Flax seed! hahaha..
Miriam, thanks so much! I am so proud of this recipe and I'm thrilled you like it too. I made this twice & still didn't get clusters. The second time, I cooked it a little longer than 20 minutes, thinking that might help, but it only helped a little. It has a great taste, though. Hmmmmm.... very curious. I'd love to give you advice on how to get those nice clusters. Did you use honey? Did you change any other ingredients? Thanks for letting me know. Feedback is always so appreciated. I just tried making some granola for the very first time. I think it turned out well and smelled so yummy. It is tasty. I used agave syrup and safflower oil. I mixed the dry ingredients then the wet and baked it for 40 minutes in a 300 degree oven. I kept checking it to make sure it did not burn. I'm here to see how to make it clump and I will try the eggwhite trick the next time I make some. My dry ingredients were chopped almonds, oats, coconut. I think I omit or use less coconut because it is sweet...but oh so good. Yep. The sweetened ones are the ones you want. Okay now my whole family is addicted. Went through a double batch in two weeks. Yay!!! Big smile over here. Do you use quick cook oats or regular? Hi Michelle, I use regular oats. I hope you enjoy the granola! This is amazing!! We love it...just tried it and already on our third batch. Personal preference, I reduced the almonds and added cinnamon. Yum! Does anyone have any idea on how many calories are in this? Thx! I love this recipe. It's my go to for granola every time. Ah thanks Karyl. SO nice to hear. It's my go to as well. I never get sick of it!